Halong Bay is one of the most charming and picturesque sights in Vietnam. With its precipitous nature beauty, Ha Long Bay Ha long bay has twice been appreciated as UNESCO World Natural Heritage Area and as one of the world’s greatest natural wonders. In order to fully discover this unaffected by human presence islands area, do not hesitate to treat yourself a tour and cruise trip In Halong bay. Now below is our brief travel guide to the magnificent Ha Long Bay. To enjoy your time in Ha Long Bay, you will need a Visa to enter the country – Viet Nam. (Click here who can have a visa exemption). The process of getting a tourist visa can be very simple, fast and easy. You can get it by applying either at Vietnamese representative offices boards, or getting a Visa on arrival (with the second is highly recommended for its convenience). 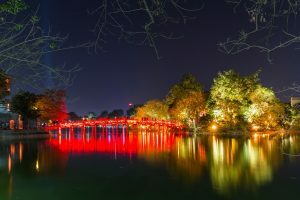 As a tourist, you can get your visa through a Vietnamese Embassy or Consulate office in your country of residence or in the country that you are travelling in before arriving in Vietnam. An entry permit form (which may be different from one Vietnamese embassies or consulate abroad to another). The form and the fee can also be different by country, so please contact directly the Vietnamese embassy or consulate to which you are applying. 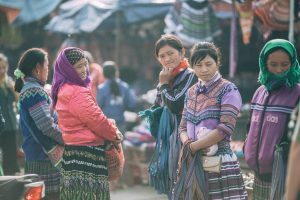 More often than not, a business visa usually requires you to submit a letter of support or introduction from your company or sponsor agency in Vietnam. If you are not close to any Vietnamese embassies or consulate, do not want to send your passport away or need it very urgently, a great option is option to obtain a visa is by applying for an approval letter online and pick up the visa at Vietnam airport. Please click here for full information of the procedure and notices. Ha Long city is 170km away from Ha Noi and 118km from Noi Bai airport. There are a number of ways to get to Ha Long bay from Noi Bai airport. From Noi Bai airport, one budgeted option is to take a bus. However, it also takes you unnecessary longer 6 hours and can stop every 5 minutes to take customers. Another highly recommended option is to take a taxi or book a pick-up service with private car, and enjoy your 3,5 hours being introduced about Viet Nam. From Ha noi center, taking a taxi or a private car costs you around $85 USD per 1 day trip or $150 USD for a 2 days and 1 night tour. Travelling by private car is considered as the best choice with its flexibility, quality, safety, and competitive rates. To rent a private car with English drivers, please visit here for further information. 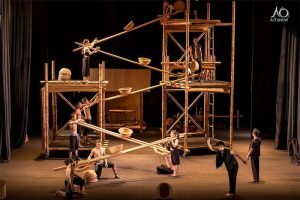 What to see in Halong? 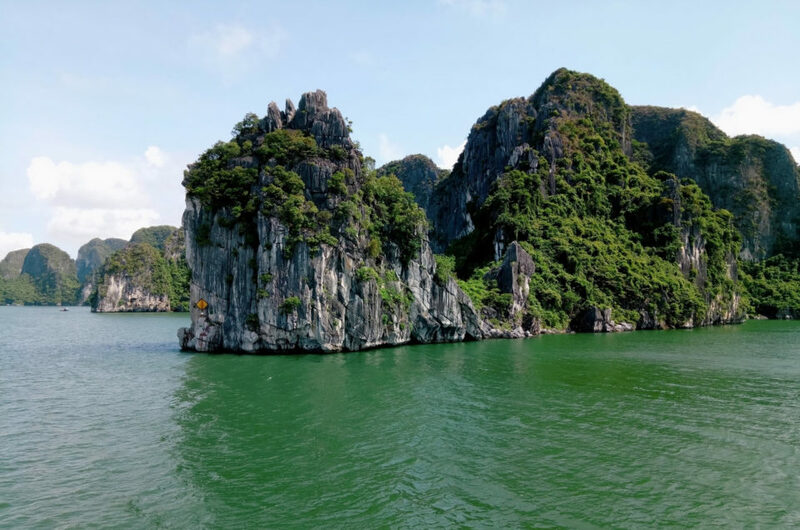 Being recognized as a UNESCO World Heritage site and one among the seven New Wonders of Nature, Halong Bay earns its name for over 1,900 islands and jagged limestone islets, with a series of activities to enjoy once get here. It would be an unforgettable experience for you to cruise on a traditional junk through the morning Halong Bay mists enjoying the fresh cheerful air, contemplating the sun rising and watch as vertical karst formations appear and then fade from view. In addition to the islands and turquoise waters, Halong Bay charms its visitors with grottoes that feel like hidden lairs. Dock the boat at Bo Hon Island and go down into Sung Sot Cave, a 130,000-square-foot chamber that drips through thousands of years shaping mystical stalactites. Additionally, you can trade with floating Vietnamese fruit merchants as they paddle right up to your boat. Their simple rowboats are also their storefront, and even their floating houses. Arriving in Cat Ba Island, do not forget to let your feet enjoy the white sand, which only some of North Vietnam’s beaches has, or go on a memorable hiking experience in Cat Ba National Park. 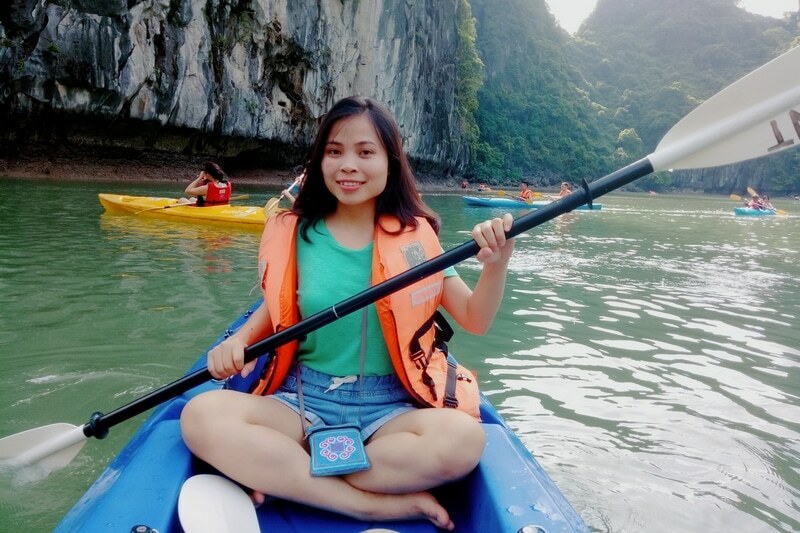 This is the most ideal option for you to investigate the stunning landscape in Halong Bay with the six hundred square miles of heaven in the north East of Vietnam, offer the visitors numerous chances to explore the mystifying haven in there. Kayaking is exceptionally popular in Halong and pulls in a ton of voyagers everywhere throughout the world. You have to try it to truly experience Halong Bay to the fullest. Halong Bay is a standout amongst the most beautifully excellent place on earth with 3000 limestone precipice, a considerable lot of which climb in the water. It merits investigating particularly for the individuals who are occupied with dashing games. With the coral reef and biological underwater community, scuba diving has become one of the most favorite activities for vacationers. This is a one of a kind chance to journey and plunge into one of the world’s incredible coral reef under the ocean. If you prefer doing something unique in Ha Long Bay, partaking in Squid Fishing to experience the recondite night in Halong Bay could be a good idea. This is specific intriguing for the gathering of companions or crew. Simply encounter yourself as an local fisherman and appreciate the accomplishments from your own experience while trying to catch the squid by a thin and long pole. Halong Bay is 103 miles and thus would take about 3 – 4 hours from Hanoi. Numerous travelers decide to spend either maybe a couple evenings cruising on the bay, which means more time for them to investigate the land, as well as takes into account the exceptional scene of limestone islets appearing after the fogs as the sun rises above the horison. You can discover the bay beauty by yourself as a backpacker with experience sharing on the internet or book with a guided tour for more convenience. For tour information, please click here. For more offer of travelling by experienced consultant and guide, please click here.